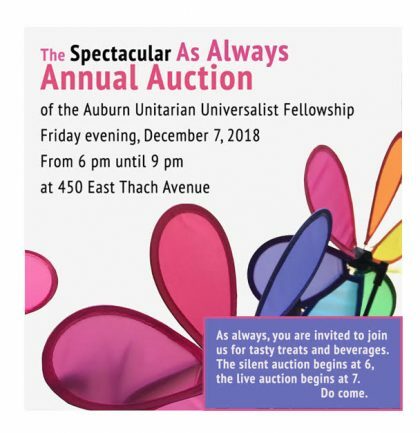 The Annual AUUF Auction will be Friday, December 7, 2018. This is our big fundraiser, and also the most fun event of the year! Everyone comes together to make the auction a success. We provide tasty appetizers, candies, cookies. We donate wine and beer. We donate unique items and delicious dinners that members and visitors alike can’t wait to bid on during the Live Auction. We also seek smaller items to include in the popular Silent Auction. There are many ways that you can help. Of course, #1 is to make donations! Or, you can be a greeter, you can help set up the auction, you can coordinate food, you can help clean up. Just ask Fleming Blackburn or Laura Kloberg for a job. They’ll be happy to hear from you. And, of course, come to the Auction, have fun, and support the Fellowship!